It all started when I received a rather cryptic text from a fellow Cortina owner letting me know there was a Lotus Cortina listed on the Los Angeles Craig’s list. I quickly fired up the laptop to check it out and sure enough, there it was. The ad listed the car and spare parts at $6500.00. The images were not too good but a few clues indicated it to be a real MK1 Lotus Cortina. Now if you know the Lotus Cortina you know they are somewhat rare with a just a few thousand produced between 1963 and 1966. Only about 200 found there way to the USA and only the later leaf spring version. They typically sell for $20,000 to $180,000 depending on condition and provenance. So at $6500.00 this looked to be a solid bargain. After receiving the text and looking at the Craig’s List ad, I quickly replied to my friend that sent the text asking him if he was interested in partnering on the car. He declined. I then decided to offer the chance of partnership to another like-minded English Ford owner, Tristan to see if he was interested. I texted the Craig’s List ad to him and waited for a response. The first response was “I’m at dinner and Vivian is glaring at me” but then quickly changed to a back and forth exchange of comments like “can this be real?” and “call before it’s sold”. Tristan contacted the owner and we arranged to meet him at 8am in Lancaster about 100 miles north of Los Angeles at the location of the Lotus Cortina. Tristan and I wanted to make sure we were there early fearing a line of people waiting to buy the car so a 5:30 am departure was agreed on. During the drive up we discussed the many options but the general intention was to flip the car for profit should we decide to buy it. We called the owner as we neared Lancaster and met him at the house at 7:30. The three of us walked in to the backyard and there it was in all of its glory. After a quick review and check of the unique Lotus Cortina features, I confirmed that is was a genuine example. I continued to look around the car checking for rust and any major issues. The engine compartment and boot paintwork seemed to be in original unrestored condition. The outside of the car had been repainted but looked to be in great condition. The owner then revealed the icing on the cake. He led us to a small storage area and opened the door. It was like the proverbial Mother Load filled with old Ford boxes containing NOS parts, parts wrapped in bags with the Lotus logo and boxes from notable Lotus and English Ford specialists like Dave Bean Engineering and JAE. I honestly thought I was going to have a heart attack. There were clearly enough parts to finish the car and build several more. Restored seats, dash tops, NOS gauges and more. This was quickly turning into to those once in a lifetime finds… but wait; the deal was not yet done. The entire time we were there, the owners phone was ringing and I could hear him say “ yea…really…well there are people looking at it now”. The ad had been posted on the famous Bringatrailer.com website that was generating a tremendous amount of interest. He mentioned to me on several occasions callers were offering three times the asking price sight unseen. I replied that yes, that happens all of the time but we were there and ready to do the deal. Tristan and I consulted with each other and agreed to go ahead with the purchase. Ironically the guy we had been dealing with was not the owner but a friend of the owner. Luckily the real owner was at the property doing some construction work and was easily reachable. After a short debate, both decided that since we were there with cash in hand they would honor the price. The cash and vehicle title were exchanged and the deal was completed. 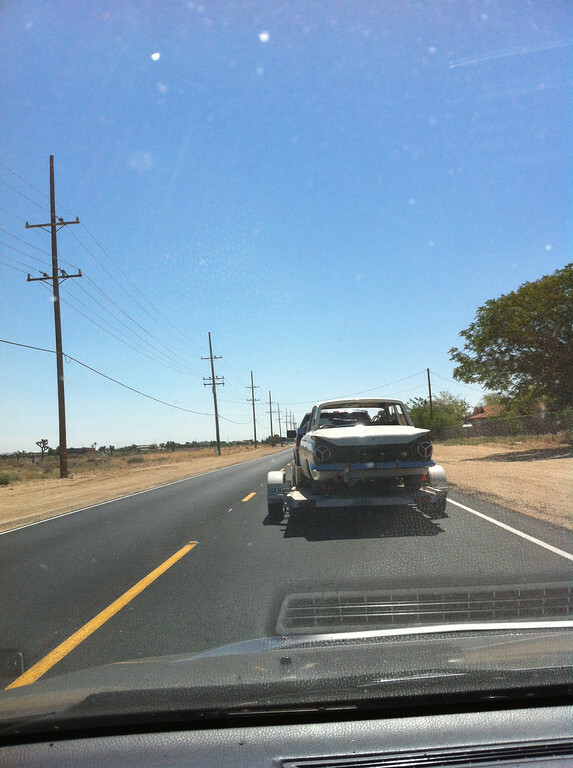 The next challenge was transporting the car and the hoard of parts back to Los Angeles. Tristan and I had debated during the drive up about the best way to move the car should it turn out to be the real deal. Quick thinking Tristan inquired with one of the owners as to if they would be interested in trailering the car for a few hundred dollars. They agreed and left to pick up the trailer while we carried the stash of parts to the front of the house for easy loading. 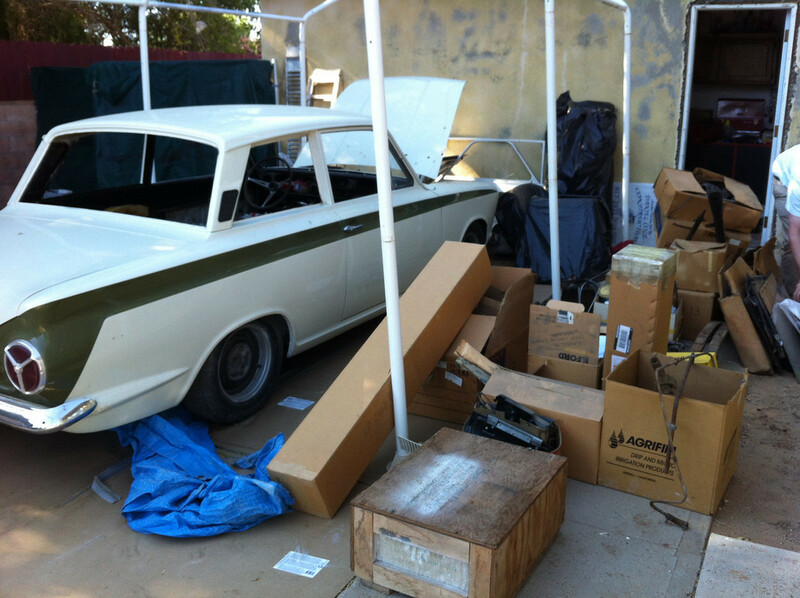 The Cortina was pushed to the front of the house and loaded on the trailer along with the spare parts and the trip began back to Los Angeles. Tristan decided to ride along with the owner and I followed. During the ride back, Tristan said the owners phone did not stop ringing with offers for the car. The owner said his phone started ringing at 1 am with calls from Europe and UK with callers leaving messages offering three and four times the asking price. The trip back was uneventful with light traffic and great weather. Arriving back, we quickly unloaded the car and what seemed like several tons of parts. Not only were there boxes of parts but also the car was filled up to the bottom of the windows with spares and parts to complete the car. With everything unloaded, the owner left and both Tristan and I contemplated the next step. As it turns out, the car is in much better condition than the ad indicated and the parts collection only sweetened the deal. We spent an entire day sorting through parts and inspecting the car. The car is in remarkable shape with no signs of major damage or rust. Both Tristan and I are now faced with many options on what to do with this fine example of a rare car. Do we sell as is? Do we put it back together and sell it? Do we keep it with shared ownership? All of the options are enticing and will certainly be debated in the coming weeks and months. For me, this possible once in a lifetime deal and the adventure of actually picking up the car was almost surreal and the experience was priceless. 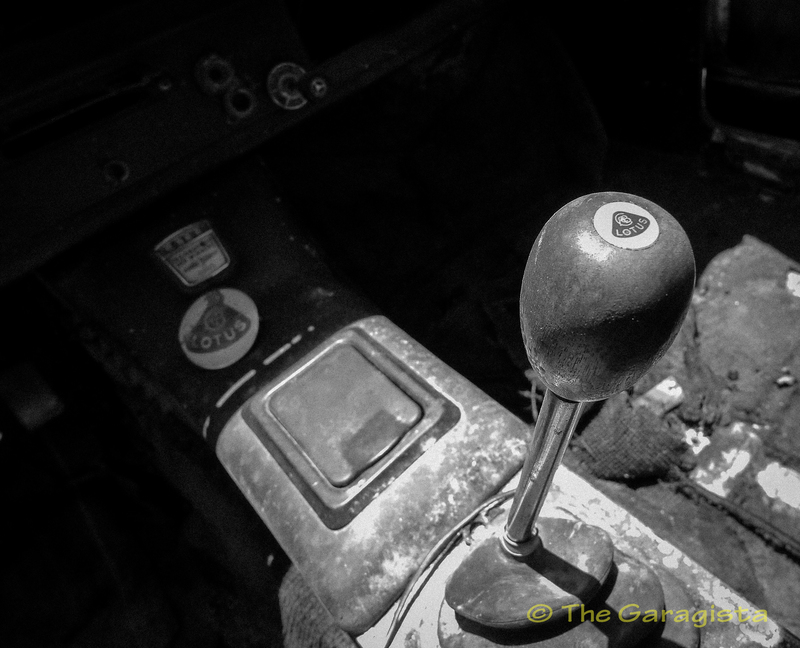 Gallery | This entry was posted in Colin Chapman, Lotus, Lotus Cortina, Retro and tagged barnfind, bringatrailer, Colin Chapman, Cortina, English Ford, Lotus, Lotus Cortina, Lotus Twin Cam. Bookmark the permalink. 2 Responses to Lotus Cortina Luck…..
awesome story Ken. let me know if you wanna put the V8 in it like the owner’s kid wanted to do :). on a serious note, let me know if you need help, I feel like any work i can do on it still won’t repay you for helping me make the deadline on GTR. Not like that deadline matters anymore :(.